SHARON, Mass. – The opportunities were there, but unfortunately the finishing wasn’t for Sharon on Sunday afternoon. The Eagles had the advantage in possession and chances created but couldn’t take advantage. Meanwhile, Pembroke was efficient in the offensive third, making the most of their opportunities and picked up a 3-1 win over the Eagles. While both sides had chances early on – Pembroke’s Cory Arscott’s header pushed aside by Sharon keeper Ethan Kantor in the 5th minute and Sharon’s Andrew Reyes-Jones having his shot blocked by a scrambling Pembroke keeper Dan O’Neill both inside the first 10 minutes – it took until after the Titans to score for the Eagles to settle in. After Sharon had an offensive possession thwarted, Pembroke jumped out on the counter with Nathan Horner grabbing possession on the right sideline. After a couple of touches to get into the attacking third, Horner launched a shot to the far post that just eluded Kantor’s leap and found the side netting to give the visitors a 1-0 lead. The Eagles used long throw-ins from Tyler Hippler to generate some chances but a handful of opportunities bounced through the area without a Sharon player getting a clean touch. 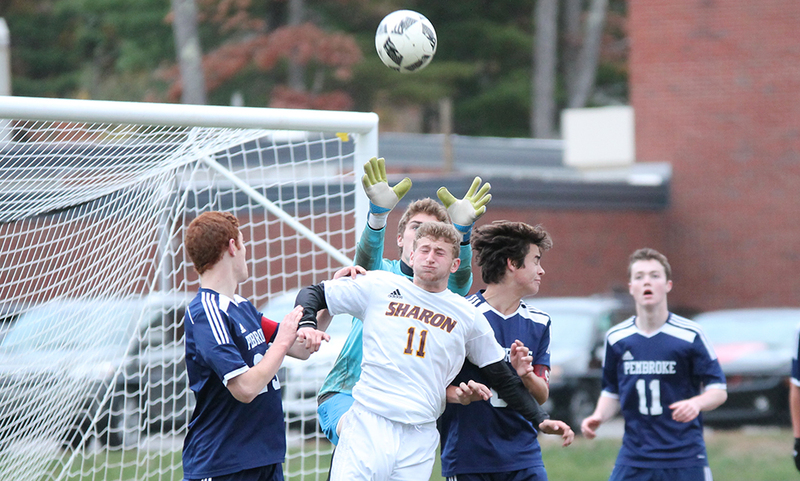 In the 37th minute, Sharon freshman Michael Baur did get on the end of a throw from Hippler but O’Neil did well to stop the chance. 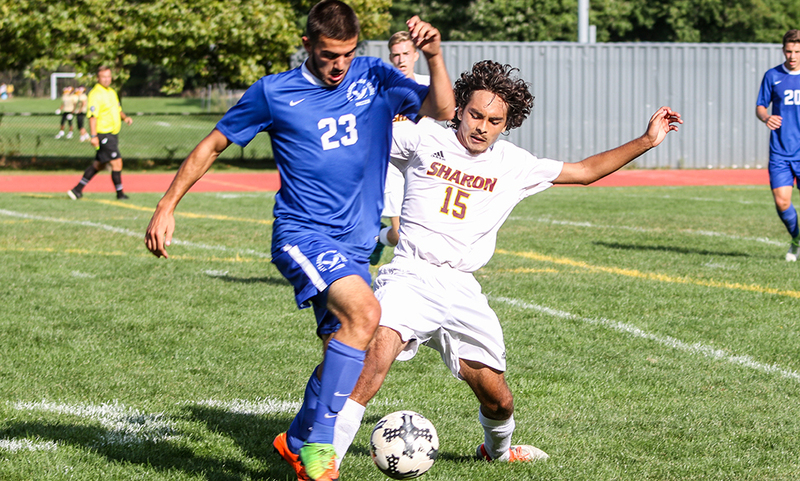 While Sharon had a strong start to the second half, Pembroke grabbed the all-important next goal in the 50th minute. Christian Pulselli played a through ball behind the defense to Sal Perrotto. Kantor made the initial stop charging out but the rebound went right back off Perrotto and found the back of the net. Sharon nearly responded immediately when O’Neil dove out to punch a corner kick from Baur. 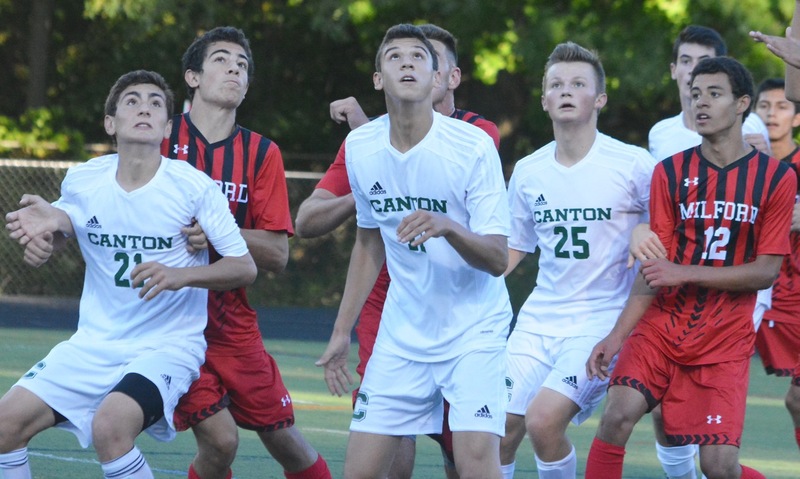 The ball ended up at the feet of Ian Camilli, who uncorked a shot from inside the area but O’Neil was back in position and handled the strike. Pembroke iced the game in the 60th minute when Roman Frattasio was able to generate some space along the left wing and hit a shot that snuck in at the near post. The Eagles pushed numbers forward at the end and were able to draw a penalty kick in the final minute. Jeffrey Gao, who drew the foul, buried the penalty to the bottom left to make it 3-1. Sharon boys soccer finishes the season at 11-4-4 and as the 2016 Hockomock League Davenport Division Champions. It was the program’s first league title since 1994.